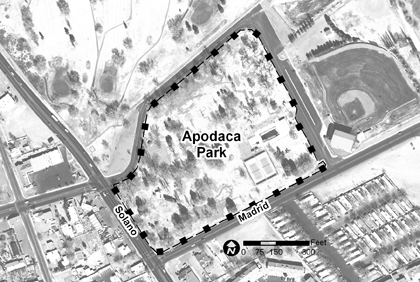 Apodaca Park was named after Mike Apodaca, Las Cruces Mayor from 1953-1955. The sculpture facing the entrance of the park, called Dineh (Navajo and Apache for “human being”), honors all the Native Americans of New Mexico and was dedicated in 1986. Log In or Register to favorite trails and keep track of your walks! Apodaca Park is a grade 2 [?] trail with one loop for a total of 0.6 miles (1267 steps).